^ 1.00 1.01 1.02 1.03 1.04 1.05 1.06 1.07 1.08 1.09 1.10 1.11 1.12 Baldzizhar, A; Manuylova, E; Marchenko, R; Kryvalap, Y; Carey, MG. Ventricular Tachycardias: Characteristics and Management.. Critical care nursing clinics of North America. September 2016, 28 (3): 317–29. PMID 27484660. doi:10.1016/j.cnc.2016.04.004. 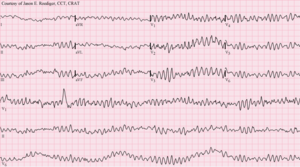 ^ 2.0 2.1 2.2 2.3 2.4 Types of Arrhythmia. NHLBI. July 1, 2011 [7 September 2016]. （原始内容存档于7 June 2015）. ^ 4.0 4.1 Berdowski, J; Berg, RA; Tijssen, JG; Koster, RW. Global incidences of out-of-hospital cardiac arrest and survival rates: Systematic review of 67 prospective studies.. Resuscitation. November 2010, 81 (11): 1479–87. PMID 20828914. doi:10.1016/j.resuscitation.2010.08.006. ^ Barash, Paul G. Clinical Anesthesia. Lippincott Williams & Wilkins. 2009: 168. ISBN 9780781787635. （原始内容存档于2017-08-08） （英语）.